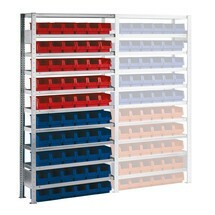 This container rack base unit for Euro boxes enables systematic storage of your consumables. The rack features guide rails, which allow the containers to be inserted and withdrawn with ease. This shelf rack with storage bins and a shelf load of 100 kg is the perfect storage and picking solution for small parts. It features variably adjustable shelves, while the boltless assembly system ensures straightforward installation, conversion or expansion with add-on units. This container rack add-on unit for Euro boxes provides flexible storage for your consumables. It features a solid construction with corrosion-resistant materials. 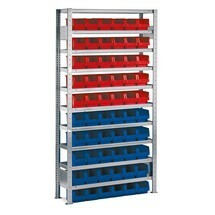 You can adapt the number of levels of this box rack to suit your requirements. Stable shelving modules equipped with storage bins to facilitate order picking of small parts and materials. The diagonal bracing offers enhanced stability.